We’ve heard the horror stories. If the names Fernvale Link, the Trivelis, or The Sea View ring a bell, then you would know what they all have in common: multiple defects found within each development. (No) thanks to social media and traditional news channels. I’m sure we can all agree, that the last thing we want is to be one of the victims of these headlines. While it is unfortunate that we cannot change the past, we can make a difference to the future. Fret not, future homeowners, because there is a group of people who can ensure that all of these defects are brought to light, and subsequently rectified! 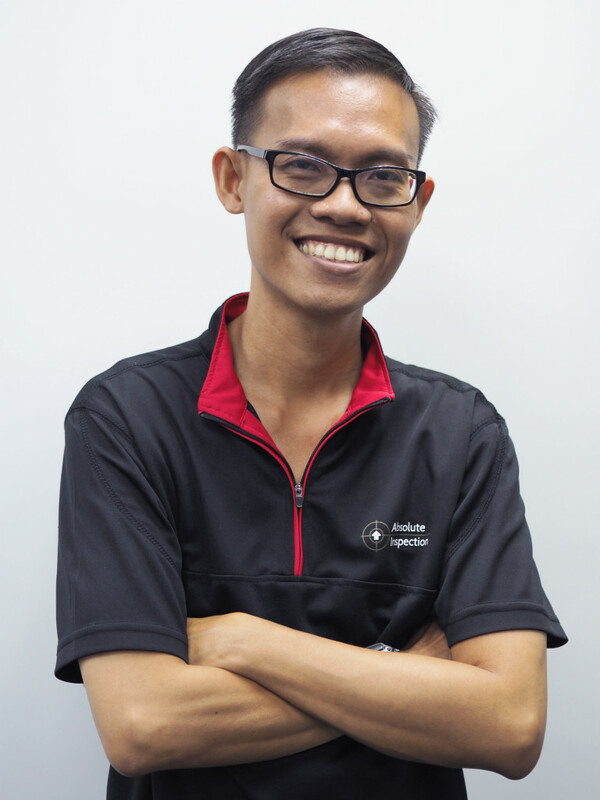 As a relatively unknown service in the industry, Mr Tan Wee Kwang and his team at Absolute Inspection Pte Ltd have already served over 1000 customers since 2015. Their job? To spend half a day in your brand new house, scrutinising and identifying all kinds of defects visible to the naked eye based on the quality standards of BCA and the industry norms. 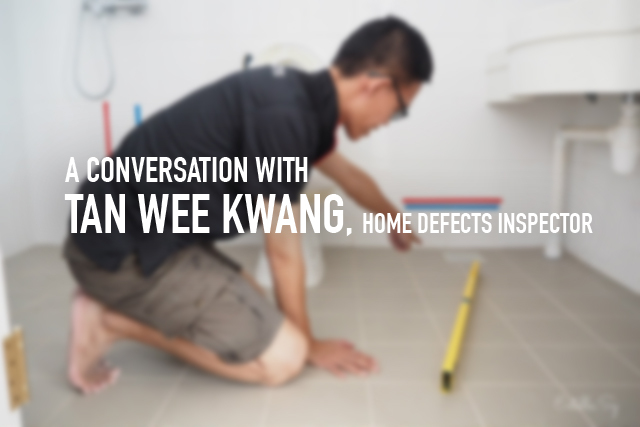 Wee Kwang’s passion is to use his building & construction experience, to help his customers ensure a smooth defects rectification process so that they are well on their way to living in their dream homes. The Redbrick Team (RB): Why did you start this career? Wee Kwang (WK): I started at the Building & Construction Authority (BCA). I love the construction industry so I joined it. When I was young, construction was a very in thing. Engineers were amongst the highest paid profession in the 70s and 80s, but times have changed. Then, there was a construction boom and people in this line were playing a very important role in the society. They were also very well provided for. I was told by seniors in the past that when project managers joined a company, sometimes they would get a car. Some of them get houses too. Every country needs a construction sector, because construction is always a part of nation building. Today the economy is such that construction only accounts for around 3% of the national GDP every year. For the longest time, it has not been a very favoured sector, but people forget that without infrastructure and buildings, you cannot carry out a lot of activities, including manufacturing, retail, financial activities, etc. RB: How many customers/cases do you have in a year? WK: We started business on August 1st 2015, and as of end July 2016 we have already served more than 1,000 customers, including inspections, consultations, etc. We try our best to help property owners as much as we can. RB: How do you manage a customer’s expectations with regards to defects? WK: Our inspections are carried out with reference to BCA CONQUAS standards and industry norms. BCA CONQUAS is the national yardstick for construction quality and there are many BCA publications online sharing what they deem are defects, and what are not. Homeowners can just Google and familiarise themselves with these standards. Whenever there are disputes with developer and main contractors regarding the validity of the reported defects, we try to refer to these publications and photos. The industry respects the standards of the authority, and that’s how we keep things moving. RB: What are some of the most difficult areas to check? WK: Areas that are hard to reach. For example, we would very much like to check the ceilings of loft buildings, but the thing is, we travel around in vehicles and there is a limit to the longest ladder we can squeeze into a vehicle. The saving grace is that there is a viewing distance of 1.5m away at which we are supposed to examine floors, walls and ceilings for defects, and this helps when we do not have a ladder that is long enough to reach the ceiling. Besides floors, walls and ceilings which come with stipulated viewing distance, our team also adopts reasonable viewing distances when inspecting other items in a property. To us, the whole essence of checking for defects revolves around identifying and making good things which we feel will bother the owner in his/her day-to-day normal living in the house. So for example, when you move around in your house, you walk and not crawl. Therefore if you can see any defect on the floor from your eye level, (which should be about 1.5m away), that should ideally be made good. Likewise, when you open doors and windows normally, you should be about one arm’s length away. Any defect at this distance or more should ideally be made good too. Other difficult areas include confined spaces and external areas such as aircon ledge, as we are not allowed to climb out due to safety reasons. To us, the whole essence of checking for defects revolves around identifying and making good things which we feel will bother the owner in his/her day-to-day normal living in the house. RB: What are the tools you need to check for defects? WK: We use a tile tester, which is this metal rod with a ball at the end to check for tile hollowness. We also use the spirit level, to check floor gradients and tile lippages for wet areas such as balconies, kitchens and toilets. We also use the try-square to check if walls are erected at 90 degrees. Besides these equipment, we also have other equipment for testing LAN cable points, lighting points, and power points. For power points, a lot of home owners use a mobile phone charger or light bulb. The difference with using a proper socket tester is that we are able to check the proper connection of earth and neutral wires as well. There are other tools as well, such as laser setting out equipment, but these are the main ones that our inspectors use on a daily basis. RB: What is a typical day at work like? WK: A typical day at work for my inspectors would be to inspect one property in the morning and another property in the afternoon. We are pretty flexible with the inspection arrangements in the sense that we are ok if homeowners want to stay in the house while we carry out our inspections. Sometimes homeowners like to see and understand what we’re doing, and there are times that they even join in as well. We also have another group of clients, mainly overseas clients, who pass us the keys and don’t come back at all. They would authorise us to settle everything for them. These are the two ends of our spectrum of clients, and we are okay with that. Most importantly is that we try our best to cater to the needs of our clients in so far as the scope and mode of inspections are concerned. Nowadays, I seldom conduct the first inspections where we identify and mark out the defects, and fill in the defects list for the homeowners. I usually go for the follow up inspections, so it’s a lot of house hopping for me. Follow-up inspections are critical because that is the time when I’ll meet the developer and main contractor, run through the defects list with them, and rationalise the validity of the reported defects and discuss with them on the mode of rectification for the trickier defects. Our objective is to protect our clients’ interests by identifying the defects and facilitating the joint inspection and subsequent rectification and handover inspection. We are not around to make life difficult for the contractor and the developer, but we just want things to move smoothly for everyone. In this way, the homeowner can quickly proceed to renovate the house and move in, while the main contractor can move on to other units where his resources are needed. Repeated visits (by all parties) to the same house are kept to a minimum and everyone is happy. We are not around to make life difficult for the contractor and the developer, but we just want things to move smoothly for everyone. RB: What are the challenges you face at work? WK: The entry barrier to this service provision is very low, hence it is common to see interior designers and property agents who may not have the necessary training and construction background but claim they know how to check defects, and would ask their clients not to engage us. The thing with interior designers and property agents helping their clients to inspect their properties is that there is a clear conflict of interest between their core services (i.e. renovation and property rent/sale) and helping an owner to inspect his/her house. Let me give you an example without over generalising on this issue. A property agent helping to rent out a property earns commission by closing the rental deal. If the same property agent also helps the owner to inspect the property for defects, he is put in a conflicted position where the more thorough he inspects a house, the more defects he is likely to uncover and the longer the time needed to rectify the defects before the tenant can move into the house. So this might come at the expense of him closing his deal faster. The same logic would apply to interior designers whose payment progress is dependent on how early they commence their renovation works, etc. Also, we hardly get repeat customers because realistically speaking, not many people in Singapore can afford to buy 2 or more new properties in the span of a couple of years. Most are first-time customers, so they may not know our company well enough. This, coupled with the fact that home inspection is a relatively new service to most homeowners, means that most of them tend to be very wary. However, we noticed that this is getting a lot better over time and I reckon that it is also because our reputation has been growing so people are able to put more faith in our work despite having never used our service before. Nowadays we collect full payment even before we finish all 3 inspections, and people have been able to accept that. RB: How much time do you spend per session? WK: Usually, it’s about half a day for the first inspection, except for landed properties where we usually set aside one day. Depending on the inspection area, we’ll decide how many inspectors to deploy to the property. Once in a while, developers and groups of residents have also engaged us for large-scale inspection jobs, such as defects inspection for common areas, and some of these jobs may take as long as 1 month to finish. RB: What are the types of defects people usually miss out on if they do it themselves? WK: It depends, because different types of defects bother different people. For example, some people are particular about marble defects. Some people are happy as long as there is no water seepage in the house. When people have certain defects that they are preoccupied with, they tend to go easy on other types of defects. Generally, I think most people will catch cosmetic defects, such as stains, scratches, dents, and chips. They may not have the engineering or construction knowledge to check mechanical and electrical services and may not know if something is not constructed properly. Also, they may not have the benefit of seeing hundreds of houses every month (like us) to know what is “normal” or not “normal” for every component in a house. RB: What sort of defects should a landlord look out for when taking back the unit from a tenant? WK: Helping landlords to inspect their properties at the end of every tenancy is a new service which we are providing. Some landlords and property agents come to us because there could be a lot of damages after a tenancy ends and they want us to help with landlord-tenant disputes as a 3rd party. So it helps if we start doing systematic documentation of new damages after every tenancy. With the “before” and “after” inspection reports showing the new defects (excluding wear and tear) created by the present tenant, it is easier for the landlord and the tenant to work out any agreement on the repair needed without any dispute. RB: What is the maximum number of defects in a property? WK:T he longest defect list we have done till date stands at more than 300 items. It is a huge house of close to 10,000sqft and many of the defects are cosmetic in nature and repeated across the various rooms. When there are repetitions we don’t write it one by one. The shortest defect list we have compiled only has 34 different items. It is a BTO flat. RB: Based on your experience, what kinds of properties have the most defects? WK: Generally, HDBs have lesser defects than condominiums and ECs because the latter comes with many more components, such as carpentry. Within the same project, we have noticed an interesting trend in which the units on the top floor generally tend to have more defects. We are not sure but our speculation is that top floor units are subjected to direct damage from the weather elements. Water seepage is also more commonly observed on top floor units. RB: Based on the cases you’ve dealt with, have you any missed out on any defect that was later identified by the customer? WK: I would be lying if I said my team and I have never missed out any defect. Human error is inevitable and we try our best to minimise this by having a systematic inspection methodology and updating one another on new defect types that we come across. Once in a blue moon, homeowners may also call us to point out defects which they think we may have missed out after the defects rectification works have started. For such cases, it’s very tricky to say if the defect was a pre-existing one that we have missed out or if it was introduced later on by people working on the defects rectification in the unit. When there are so many parties working in a house, it is very hard to ascertain who created a new defect, and it is for this reason that main contractors and developers discourage homeowners from commencing renovation works before they finish their rectification works. Then there are defects known as latent defects, which may only occur later on after the homeowner has moved into his or her house. To assist homeowners on this, we have encouraged homeowners to continue to keep in touch with us even after the end of our inspection service at their houses. Till today, some of my earliest clients are still in touch with us and we try to advise them to the best of our ability. On the surface, it looks like there’s a lot of defects everywhere, but in actual fact, it is still only one house. RB: Has the quality of buildings improved or worsened compared to 5/10 years ago? WK: Personally, I feel that quality has improved over the years especially if we looked at the houses built today and the houses built 20, 30 years ago. With better construction technology and better trained personnel, it is natural for construction quality to see an improvement over time. However, over the past few years, the new media has contributed negative publicity on the poor workmanship found in houses. Whether these negative publicity is representative of the general construction quality in Singapore or not remains to be discussed. Just a simple illustration – before the era of Facebook, when you see a defect in your house you complain and only your family and friends know about it. Today when you see one defect and you post it on Facebook, your Facebook friends may start to like, comment or even share your post. This spreads a lot faster and not too long later, the whole world may get to know about it. On the surface, it looks like there’s a lot of defects everywhere, but in actual fact, it is still only one house. WK: My wife and I currently own 1 HDB flat and 2 condominiums. I think we were fortunate because we took action before the property cooling measures kick in progressively. It helps to work in the construction sector because our training and work experience mean that we are pretty well versed with the URA Master and Concept plans, etc, and people in our line are more up to date with the construction and real estate markets and are therefore able to time our investments much better. Wee Kwang is a man of many words. We were so engrossed with the stories he told that we did not realise how quickly time passed; there was simply no time for awkward silences. If you are keen to hear more about Wee Kwang, stay tuned, as he will be making an appearance at one of our upcoming events!